Asus announced the launch of a new addition to the ProArt series at CES 2017, but more than six months later the Asus' powerhouse 4K HDR monitor is still not available for purchase. However, the manufacturer released enough information to suggest that PA32U will have all the right tools to support the demands of high-end professional users. 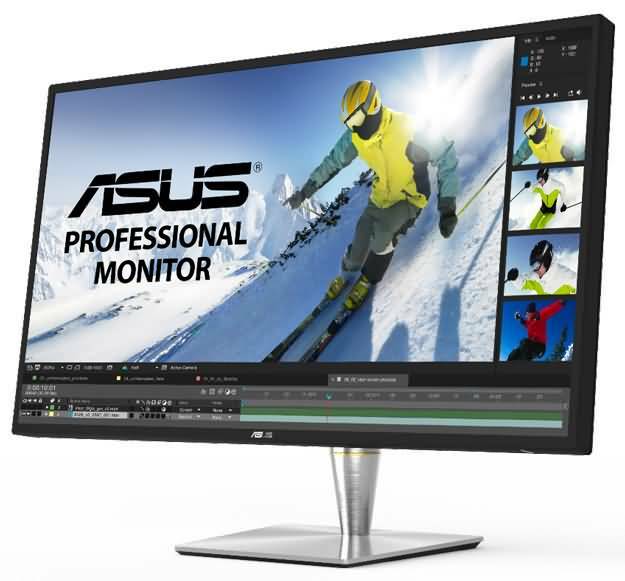 The Asus ProArt PA32U is aimed at professional videographers, video editors, graphic designers and photographers who need a 4K HDR monitor in order to create visual content of the highest standard. To make things even better the PA32U is equipped with HDR capabilities and a backlight that features 384 LED zones. We've gathered all the information about the Asus' forthcoming high-end 4K HDR monitor that you might need. As one of the leading monitor manufacturers on the market, Asus is widely known to deliver monitors that combine style with a high level of functionality. The Asus ProArtPA32U is a step in the same direction, as it is designed to look beautiful in any setting. This elegantly designed 32-inch 4K monitor is perfect for multi-image and split screen displays. The true dimensions of the monitor haven't yet been revealed by the manufacturer, but judging by its rather lengthy diagonal and thin bezels it is safe to say that the Asus ProArt PA32U will take quite a lot of desk space. The 4K HDR monitor will come with a strong stand that is capable of holding attachments and its seemingly heavy cabinet. The ProArt32U will have a modern and sturdy look with thin bezels that work as a perfect frame for highly detailed images this 4K monitor is capable of displaying. More details regarding the PA32U's visual appearance should become available as its release date approaches. From the information available to the public it is clear that connectivity is an area in which the PA32U will shine. The HDMI and Display Port will be accompanied by the Thunderbolt 3 USB-C port and USB 3.1 Gen 2 hub that enable the Asus' 4K HDR monitor to connect with a number of different devices. Such a wide array of connectivity options and a large number of ports will ensure that the monitor can meet the needs of the most demanding users. The PA32U will be one of the first 4K HDR monitors on the market and as such it will attract a lot of attention from high-end professionals who are in pursuit of the latest technology that can enable them to create breathtaking content. Although there is no official information yet, it is assumed that PA32U will have an IPS type panel accompanied by a quantum dot technology that will allow the brightness levels as high as 1000cd/m2. Furthermore, the PA32U's screen will have a backlight that features 384 LED zones and supports local dimming. The upcoming ProArt model will have a native 4K UHD resolution and a 16:9 aspect ratio. However, it is still unclear whether or not the refresh rate will remain as low as 60 Hz. The High Dynamic Range capability will significantly improve the monitor's color range, which is very important for users who work with images. Perhaps the biggest downside of the Asus ProArt PA32U is the low pixel density because it is estimated that it will be as low as 138ppi. With a maximum resolution as high as 3840 X 2160 it is hard to imagine that the image quality on Asus ProArt PA32U will be anything short of amazing. To make things even better the manufacturer has announced that their forthcoming 4K HDR monitor will be capable of reproducing 85% of the Rec2020 color space, a feature that separates the forthcoming ProArt model from other 4K monitors in similar price range. Furthermore, the PA32U will have a 100% coverage of sRGB color gamut, 99.5% of the Adobe RGB color space and 95% of the DCI-PC3, which makes it a great choice for all users who need monitors capable of delivering beautiful and vivid colors. Unlike the most monitors that store the color parameters on the PC, the PA32U can store color parameters locally on an IC chip of the monitor via the Asus ProArt calibration technology. The technology enables the users to adjust colors manually and connect the PA32U with different devices without having to re-calibrate the monitor. This feature is particularly important for those users who often work with both Mac OS and the Windows platforms. Although, the Asus ProArt PA32U is obviously not a gaming monitor all signs point out that it would perform well with video games that have demanding graphics. The information about the monitor's input lag and response time are still not made available to the public. The previous ProArt series models have struggled in this area, and it remains to be seen how much Asus will be able to improve in this aspect. Asus still hasn't made the release date of their forthcoming addition to the ProArt series public, but the Asus ProArt PA32U is expected to hit the markets in the second half of 2017. However, the PA32U will be one of the best 4K HDR monitors on the market when it hits the market and it will be worth every penny of its market value.